1)This machine adopt hemming model, with left edge cutter device and waste absorb tube. 2)Suitable for enforcing the seaming of sports ware, T-shirt, under ware, children’ ware etc. 3)New type needle bar oil-back system, no possibility of oil leakage. 4)Needle bar transmission structure, adopt all-sealed design, more safe and easier to keep clean. 5)Complete automatic supply system and oil-filter device, ensure the max sewing speed to be 6000r.p.m. 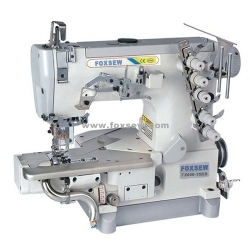 6)The circumference of sewing body is just 280mm, suitable for some small round parts such as collar and sleeve etc.